L’Equip Company established by Korea as well as the USA in the year 1998 which presently have associates in more than 20 countries in the whole world. It also turns out to be an international brand after being selected as the ‘best product’ by famous foreign media persons as well as the consumer report. After getting recognition in the global marketplace, the L’Equip is becoming a leading trademark in kitchen appliances like food dehydrator, juicer, and blender which can use domestically. The primary purpose of this company is to make those products which can provide you good health along with the happiness on the faces of their customers. With the help of the L’Equip food dehydrator, you can preserve the healthy food for long term use. We have kept in mind the useful features which are present in these machines like adjustable control function, display screen, digital control, transparent lid, timer, etc. The reviews which provided by the buyers who are using this machine are also taken into consideration while making a list. The buyers have shared their valuable experiences on the shopping websites which help us to know their experience regarding the products. The customers who use these dehydrators provide some rating on the online sites by the product's efficiency and performances. It also shows us the way to judge the product accurately. The L'EQUIP 528 6 Tray Food Dehydrator is a rectangular shape stacking food dryer which comes with six trays. In this machine, your food dries out quite efficiently. Every single tray offers 1.2 sq. ft. of dehydrating space along with the base capacity of 7.2 sq. ft. You can add six more trays for increasing the drying area of the machine which offers you a maximum space of 14.4 sq. ft. This machine manufacture from the BPA-free plastic material which is not harmful to the health of the people. It comes in the compact size so that you can quickly place it on the small size kitchen countertop. The fan, as well as heater, is attached to the base so that the heated air can blow upwards from all the trays. The fan of this food dehydrator runs very quietly which do not disturb during the night time. It is lightweight and a compact design machine which you can carry easily from one place to another. It comes with the adjustable computer controlled temperature sensor feature which benefits in drying out your food efficiently at the accurate temperature. It is effortless to clean this machine as you just have to take out the trays and wash them in your kitchen's sink. It made from the BPA-free plastic material which does not create any harmful toxins when heated up. A dedicated ON/OFF switch provided for operating the machine with ease and convenience. It can use by a professional as well as a beginner. It is an economical food dehydrator to with so many innovative hi-tech features which you usually found in expensive dryers. If you want more extra trays for increasing the expandability of the food dehydrator, then you might find the cost of the trays little expensive. The base structure of trays is very small for big size food item which can be little irritating. It does not come with any timer which is the main drawback of the appliance. The trays of the L'Equipe 528 6 Tray Food Dehydrator are not dishwasher safe, so you have to clean them with your hands. 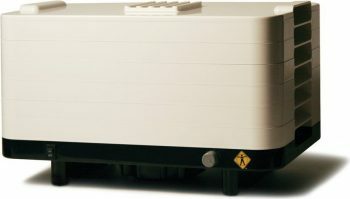 Eventually, we just want to say that the L'Equipe 528 6 Tray Food Dehydrator 500-watt is a perfect machine for any person who is looking to purchase an inexpensive, small size and a lightweight dehydrator for their kitchen. It provides you excellent value for your investment. Even if you want to replace it with your old dryer, then also it is a good option to consider. In fact, it is a good machine for first-time users. 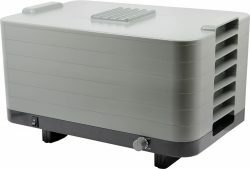 The L'EQUIP FilterPro Food Dehydrator comes with the 530 Watt drying power along with the 24 feet of dehydrating space. It has a unique feature of air filtration which allows you to dry a variety of foods on its stackable trays. The control panel of the machine is very easy-to-which also consists of a LED display. It also comprises of the features like temperature controls from 95 degrees F to 158 degrees F, timer, as well as an automatic shut-off after 24 hours. You can increase its capacity up to 15 trays in a case of bulk drying. There are some handy plastic mat inserts which stop the food from getting stuck to the trays. The L'Equip FilterPro Food Dehydrator is perfect for preparing snacks and jerky whenever you want. The operation of the dehydrator is simple, and you can dry virtually any fruits, vegetables, meats, herbs, and nuts in this device. It is perfect food dehydrator which can suit for any of the kitchen shelves. It comes with the robust construction and square design which enhances the overall beauty of your kitchen. It is compatible with the extra trays which you might want to use for increasing the capacity of the product. You can check the time and the temperature while drying food in the machine through the big size display screen. It comes with the timer feature which shuts down the machine as soon as the process of drying completes. It runs very quietly at the time of functioning without creating any annoying sounds. It is quite easy to clean this dehydrator’s trays with the help of the wet cloth and water. The fan located at the bottom most area certifies that hot air will be dispersed straight through the trays so that the whole food can dry effortlessly. There is no need of trays rotation. It manufactured from the high-quality BPA free plastic material which ensures the food items uphold their nutritious content. It consumes very less power at the time of food drying. It results in the uneven dehydration sometimes if you do not cut the food properly in regular shape, for example, mushrooms. When you expand the capacity of the machine by adding more trays, it might result in a decline in the dehydrator's heating capability. Since the fan located at the bottom, sometimes the food gets dropped down on it which can lead to a big problem later. There is no transparent lid given in the dryer which does not allow you to check the status of the food while drying. It looks like a plastic machine with no robust construction. You cannot wash it in the dishwasher which can be little irritating. You will not get any sound or signal if the timer gets up. The L'Equip FilterPro Food Dehydrator is a sturdy kitchen appliance which comes with lots of innovative features which makes it one of the best top dehydrators in the market at present. You will get amazed with its appropriate size, structure, as well as performance while drying out various foods. If you are looking to buy a food dehydrator which is user-friendly, and also serves you for several years, then you should buy the L'EQUIP FilterPro Food Dehydrator. The third name our list is of L'Equip 306210 530-Watt 6-Trays Food Dehydrator which runs on the power of 530 watts. 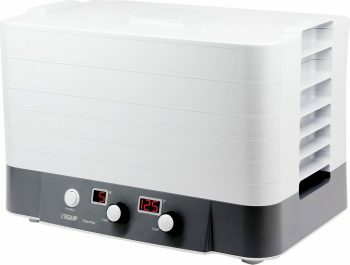 It is a perfect food dryer for drying herbs, jerky and fruits. It comes in the size of 11.8 x 17 x 10.4 inches so that you can dry out lots of food in one single point of time. It might look like a giant machine, but it weighs only 11.6 pounds. You can quickly move this lightweight machine to nay corner of your house easily. It also comes with the six stacking trays which offer you 12 square feet of dehydrating area. The heating element, as well as a fan, is located at the rear so that the air can move horizontally all over the trays. Along with the perfect results, the machine comes with computer controls so that you can regulate the time and temperature. It runs very quietly during the process of drying. After placing the food inside the machine, you just have to set the beset moisture content, and its thermostat will stop instantaneously when the level attained. It heats the trays during the drying process and not the entire machine. The fan is located at the back of the dryer so that less noise produced and also your food gets dried faster. It is a reasonably priced machine as compared to the other similar models. It possesses an excellent design and construction which increases the beauty of your kitchen. The manufacturers of the product provide 12 years extended warranty period to their buyers. The hole in the middle of the tray can lead to the leakage of the food which is in a liquid state. The trays need to wash with the help of hands. You have to buy the fruit leather sheets as well as a jerky kit distinctly as it does not comes with the machine. It is a god and reasonable food dehydrator which you can look for buying for your kitchen. It comprises of all the essential features which are required for drying all kinds of foods evenly. The main USP of this machine is its long warranty period which provides you a sense of safety while using the dehydrator for many years. Any person is looking to buy a reliable and consistent food dehydrators for using long term period should go for the L'Equip food dehydrators. It is a well-known brand in the market of food dryers which always try to provide the products with useful features and specifications. In the above article, we have selected and reviewed the top three best L'Equip dehydrators which you can easily find on the market. Our primary purpose is to provide you those products on the website which offer you a great value for money invested. Now you have to decide that which L'Equip food dehydrator will suit your needs and budget. We are sure that whatever product you buy from the above list, it’s going to be a part of your kitchen for several coming years. If you have any question or query in your mind regarding the above products, you can simply write to us in the below comment box. We will answer your question soon.